The history of the Alfa Centrum factory buildings is closely tied with the history of Białystok itself ─ a city, which at the turn of the 20th century was famous for its thriving textile industry. Alfa is a part of the history of the Podlaskie region, its culture, and the art of that period. Today, the extraordinary and atmospheric interior design, which seamlessly combines modern solutions with historic industrial architecture, stands out among contemporary commercial buildings. Świętojańska Street (formerly known as Prudcka Street) is where this history begins. After 1831, when a customs barrier was set up between the Kingdom of Poland and the Russian Belostok Oblast, factory-owners started settling in the heart of the Podlasie region. The city entered into a period of rapid industrial development and prosperity. At the turn of the 20th century, new textile factories started production, helping more people from the region to find a workplace. 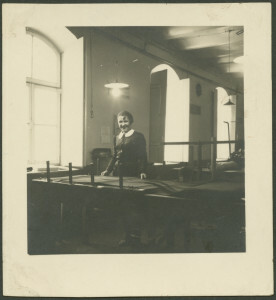 After 1918, a factory located at the street formerly known as Prudcka became one of the city’s biggest textile manufacturers. In 2008, after nearly a hundred years, the grand opening of Alfa Centrum was held. History came full circle and tradition was reintroduced. Today, Świętojańska Street, where Becker’s thriving factory used to stand, has become the beating heart of the modern fashion world. 1883─1890 ─ Eugeniusz Becker, a German business magnate, comes to Białystok to buy the premises at the crossroad of Prudnicka (Świętojańska) and Brzeska (Mickiewicza) for 400 rubles together with Alfred Frisch. In this manner, a new wool and silk weaving mill opens in the city. Later, Becker parts ways with his business partner and further develops the factory. After only 7 years, his employee count goes up to 123. 1895 ─ Eugeniusz Becker, along with August Moes, one of the most influential factory owners in Białystok, establishes the city’s first joint stock company under the name “Bialystok Manufacturing Company Eugeniusz Becker and co.” (“Towarzystwo Białostockiej Manufaktury Eugeniusz Becker i S-ka”). 1900 ─ Becker and Moes employ more than 300 employees. 1905 ─ A change in the company’s management board. Moes become the head of the company. The factory still produces luxury wool and silk. 1914─1918 ─ More than 600 employees work for the “Białystok Manufacturing Company Eugeniusz Becker and co.” The company’s yearly production exceeds the worth of half a billion rubles in gold. World War I breaks out ─ the company’s management board is forced to move the factory equipment out to Russia. However, Becker manages to trick the Russian Empire by sending them boxes full of scrap and production materials. Thanks to this clever ploy, the factory can resume production in August 1915. After 1918, it becomes one of the city’s biggest textile manufacturers. 1921 ─ the Union of Białystok Industry (Związek Białostockiego Wielkiego Przemysłu) is formed. It is comprised of several biggest factories operating in the region. Its headquarters are located at Kupiecka Street (Malmeda). The Union was formed for the mutual benefit of its members, who helped each other to attract new customers and to find new markets for their products. Naturally, the “Białystok Manufacturing Company Eugeniusz Becker and co.” is a member of this business society. 1926 ─ Karol Geyer, a business magnate from Łódź, becomes the head of the company. 1929 ─ A financial crisis breaks out. Financial difficulties affect the textile factory as well. To endure the crisis, the company sells most its stocks. Karol Geyer becomes the main stockholder, owning more than 75% of the stocks. Nevertheless, the company still operates under Becker’s name. 1937 ─ A large group of employees goes on a sit-down strike. 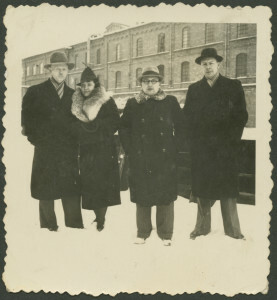 1939 ─ The factory is taken over by the Soviets, who introduce a new company name: State Plush Factory. 1941 ─ Company management is taken over by the Germans. Throughout the entire German occupation, the factory operates under the name Pluschfabrik Werk in 31-Bialystok. 1944─1946 ─ factory buildings are destroyed by bombings. Only the Becker Palace remains unscathed. 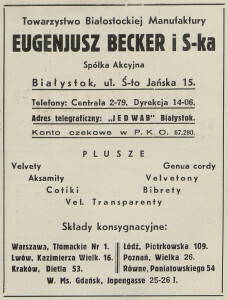 When war ends, the state becomes the rightful owner of the “Białystok Manufacturing Company Eugeniusz Becker and co.”, in accordance with the decision as of 10 December 1945. The locals promptly start rebuilding the factory and as early as in 1946 it resumes production under the name State Silk and Clothing Factory. 1950 ─ The factory changes its name again to Białystok Plush Factory. 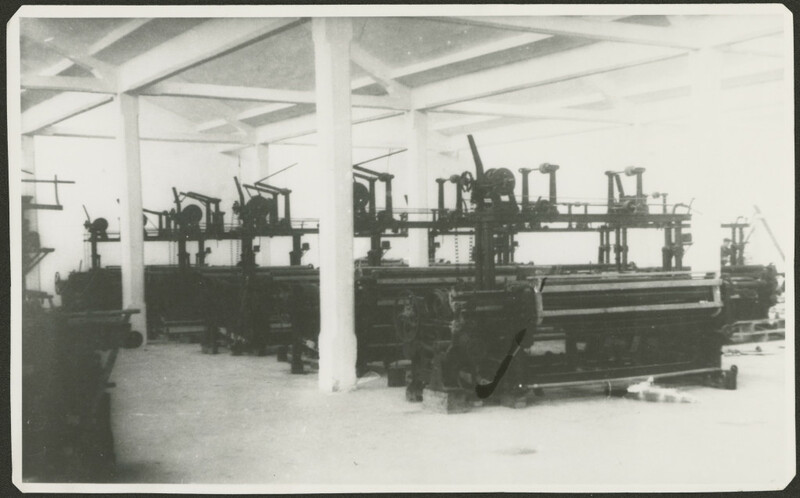 1975 ─ The factory starts operating as “Biruna” Textile Factory. 2006 ─ Biruna moves its production to Wasilkowo, and the premises of Becker’s old factory are being adapted for a modern shopping center. 2008 ─ Alfa Centrum is opened in the old factory buildings. Becker’s old factory is great example of Białystok’s industrial architecture from the turn of the 20th century. The textile factory was comprised of 10 buildings, which were constructed between years 1883 and 1911. A few of them survived up to this day: the so called Becker Palace (built between 1902 and 1905) and a warehouse for storing finished products from 1895 located nearby. Both of these buildings are currently on the list of objects of cultural heritage. The first one is a fine example of the French Renaissance Revival and was the headquarters of the “Białystok Manufacturing Company Eugeniusz Becker and co.” management board. 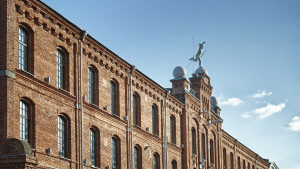 The second one, a red-brick warehouse, is decorated by an old sculpture of Mercury, which still proudly stands on top of its roof. Legend has it that the figurine was created to honor the memory of Becker’s son, who died tragically. Alfa Centrum is based on the architectural form of this warehouse. The signs of the buildings long history can be found all over the center, for example the cobblestone or the fragments of an old 1911 stable, where currently the Sphinx restaurant is situated. At the back of the Alfa Centrum, at Parkowa Street, there is a 1900 building, in which engineer Wille, the factory administrator, lived. In 1989, it held Białystok’s first private pregnancy clinic.